These are the crown jewels, the encryption keys themselves. Leaked secret keys allow the attacker to decrypt any past and future traffic to the protected services and to impersonate the service at will. Any protection given by the encryption and the signatures in the X.509 certificates can be bypassed. Recovery from this leak requires patching the vulnerability, revocation of the compromised keys and reissuing and redistributing new keys. Even doing all this will still leave any traffic intercepted by the attacker in the past still vulnerable to decryption. All this has to be done by the owners of the services. These are for example the user credentials (user names and passwords) used in the vulnerable services. Recovery from this leak requires owners of the service first to restore trust to the service according to steps described above. After this users can start changing their passwords and possible encryption keys according to the instructions from the owners of the services that have been compromised. All session keys and session cookies should be invalidated and considered compromised. After seeing what we saw by "attacking" ourselves, with ease, we decided to take this very seriously. We have gone laboriously through patching our own critical services and are dealing with possible compromise of our primary and secondary key material. All this just in case we were not first ones to discover this and this could have been exploited in the wild already. The most notable software using OpenSSL are the open source web servers like Apache and nginx. The combined market share of just those two out of the active sites on the Internet was over 66% according to Netcraft's April 2014 Web Server Survey. Furthermore OpenSSL is used to protect for example email servers (SMTP, POP and IMAP protocols), chat servers (XMPP protocol), virtual private networks (SSL VPNs), network appliances and wide variety of client side software. Fortunately many large consumer sites are saved by their conservative choice of SSL/TLS termination equipment and software. Ironically smaller and more progressive services or those who have upgraded to latest and best encryption will be affected most. Furthermore OpenSSL is very popular in client software and somewhat popular in networked appliances which have most inertia in getting updates. Recovery from this bug might have benefitted if the new version of the OpenSSL would both have fixed the bug and disabled heartbeat temporarily until some future version. 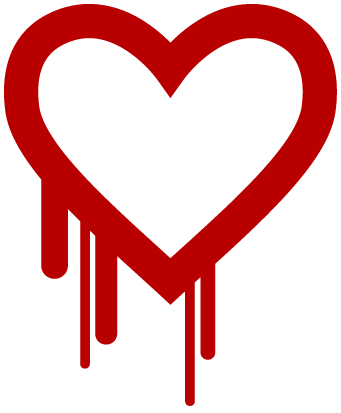 Majority, if not almost all, of TLS implementations that responded to the heartbeat request at the time of discovery were vulnerable versions of OpenSSL. If only vulnerable versions of OpenSSL would have continued to respond to the heartbeat for next few months then large scale coordinated response to reach owners of vulnerable services would become more feasible. However, swift response by the Internet community in developing online and standalone detection tools quickly surpassed the need for removing heartbeat altogether. Although the heartbeat can appear in different phases of the connection setup, intrusion detection and prevention systems (IDS/IPS) rules to detect heartbeat have been developed. Due to encryption differentiating between legitimate use and attack cannot be based on the content of the request, but the attack may be detected by comparing the size of the request against the size of the reply. This implies that IDS/IPS can be programmed to detect the attack but not to block it unless heartbeat requests are blocked altogether. No, this does not require a man in the middle attack (MITM). Attacker can directly contact the vulnerable service or attack any user connecting to a malicious service. However in addition to direct threat the theft of the key material allows man in the middle attackers to impersonate compromised services. The security community, we included, must learn to find these inevitable human mistakes sooner. Please support the development effort of software you trust your privacy to. Donate money to the OpenSSL project. Page updated 2014-04-29 07:05 UTC.